Because opossums are wild animals, the signs of illness may not be as apparent as the case with pets like cats and dogs. It is important to be vigilant if you want to see the symptoms of illness in the opossums. There are some signs that you can look for in the opossum that tell you there is an issue. This is an infection which is very contagious and infectious. It can be transmitted from the opossum to dogs and humans through direct contact with bodily fluids and flea bites. 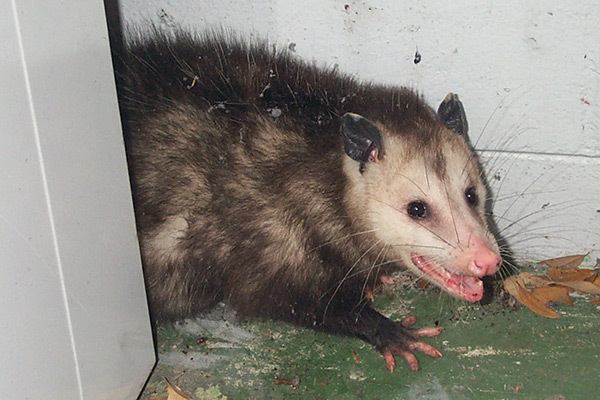 Some of the signs that the opossum has rabies include insomnia, hallucination, fever, salivation in excess, confusion, aqua phobia, aggression, anxiety and so on. If you see these symptoms with an opossum, contact authorities immediately and stay away from such an animal. This illness isn’t that common like rabies and it is a very rare disease. Just like rabies, it is very infectious and can lead to severe damage on a person’s body, and this includes the skin, lymph nodes, lungs and eyes. The signs that an opossum has got the disease include swollen lymph glands, skin ulcerations, fever, lethargy or exhaustion, and chills. Don’t approach an opossum with the symptoms because they are infectious. If you are in such a position that you have to deal with the sick opossums, then it is a must that you take very necessary precautions beforehand. You need to wear gloves and also footwear that will ensure that direct contact with the animal is minimized to the greatest limits. After you handle the animal, you need to make sure that you wash your hands as thoroughly as you possibly can. If you do unfortunately get bit or otherwise make contact with an animal that appears to be sick, contact the medical professionals immediately. If possible, have someone capture the animal safely because it may need to be tested as well. Even if you are bit by an animal that does not appear to be sick, get the bite checked out. In many circumstances, the best way to go is to call in the proper authorities who have the knowhow and equipment to deal with the opossum issue. They will know exactly what to do with the opossum. They also have the experience and training that is needed to handle the sick animal without having to injure it or even themselves. When it is possible, always call in the professionals.